Heavy duty pressed steel panels, outside and in, gives your mobile home door the residential look that will not only keep you secure, but look good doing it! The steel panel is securely bonded to 1 3/8″ thick energy efficient polyurethane foam insulation to keep the heat and cold. Vinyl coated for all-weather protection and rust prevention. Attractive Sunburst Safety Glass Clear Window with White Frame (21″wide x 10″high) lets light in while you see out. Strong welded steel frame with baked-on white finish. Available in both right or left hand hinge. Thick close-cell foam on all four sides form the primary sealing system. Installation Parts and Materials you may need: 606100 putty tape, 1/8″thick x 3/4″wide x 30 ft. 404029 Storm Chain, prevents wind blow-backs. 404054 Entrance & Deadbolt Stainless Steel, key-a-like Lock set. 707026 #8- 1/1/2 white hex head self taping screws (50 each). 707175 1/4″x 2″ magnetic nut driver for drill (fits 1/4″hex screws). 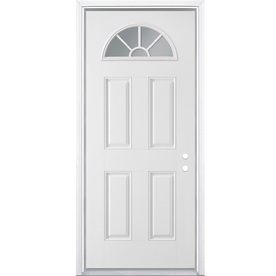 For installation tips for how to order the correct size door, Go to our How-To Icon.